How well is he playing? Maddison whipped in his third free-kick of the season as Leicester powered past Huddersfield on Saturday. It wasn't his most impressive set-piece strike - he has a growing highlight reel of them - but it underlined his recent resurgence. The 22-year-old, who joined Leicester from Norwich for £20m in the summer after an award-winning season in the Championship, made a fast start to his first Premier League campaign, scoring five times by early December and catching the eye with his performances as a No10. His form earned him a spot in the England squad for the October Nations League clashes with Croatia and Spain. Some inconsistency followed, coinciding with Leicester's wider problems under Claude Puel, but Maddison is now back in top gear again - and a positional shift implemented by Puel's replacement, Rodgers, has helped free up the midfielder. Rodgers has moved Maddison into a No 8 role, putting him at the heart of Leicester's build-up play but also giving him licence to break forwards and do damage around the opposition penalty area. The change has yielded two goals and an assist in five games, and seems a smart way of utilising a player who has fashioned 92 openings for team-mates so far this term. That figure is the joint-most recorded by a player in Europe's top-five leagues this season - level with Lyon's Memphis Depay - and Maddison's growing reputation as a creative threat is highlighted by the fact he has been fouled 66 times this season, the fourth most in the Premier League. He is a better player than I thought he was. He isn't just a good player, he has the hunger to be a better player. "He's an outstanding talent," said Rodgers. "He is a better player than I thought he was. He isn't just a good player, he has the hunger to be a better player." Maddison is bouncing too, revelling in the opportunities his new position offers. "I'm playing as a No8 now which is really enjoyable when you've got Youri Tielemans in there, and Wilfred Ndidi, who can tackle anyone," he said. "I'm playing with freedom and I feel like I got my swagger back. Ndidi allows me and Youri to have freedom to go higher up the pitch like two number eights." Where would he fit in for England? So why was Maddison left out of England's recent squad for the European Championship qualifiers with Czech Republic and Montenegro? Maddison's pre-Christmas call-up for England was on the back of his performances as a No10. However, Southgate's shift to a 4-3-3 formation after the World Cup means that role doesn't exist in the current England plan, and Maddison was instead left competing with the likes of Marcus Rashford and Raheem Sterling for a place in the front three alongside star striker Harry Kane. When asked why Maddison didn't make the cut for the latest England squad last month, Southgate explained the issue. "I think there are others in the attacking positions ahead of him. He's a No10, and, at the moment, we've not been playing a 10. In the 10 position, we've also got Dele Alli, Sterling, Rashford, and Jesse Lingard." Since then, though, Maddison has made a success of his positional change at Leicester - and would now be up against a different group of players for a place in the England squad. Jordan Henderson, Ruben Loftus-Cheek, Ross Barkley, and James Ward-Prowse are competitors for a forward-thinking role in the midfield three, having recently been deployed in that position by Southgate. Going on Premier League statistics, Maddison appears to have the upper hand on those players, having played more minutes, scored more goals, recorded more assists, and registered a high passing accuracy. 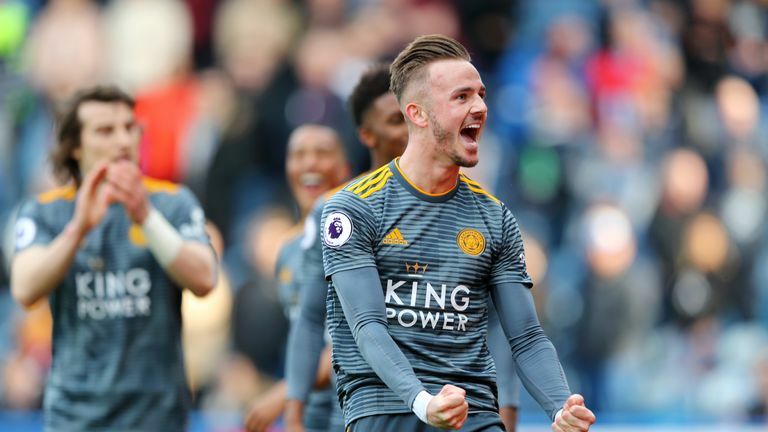 His numbers are boosted, as they include his performances in a more advanced No10 role, but if Maddison can continue to perform well in a No8 role for Leicester until the end of the season, he will have put himself in contention for involvement in the Nations League finals. Could the U21s provide a platform? Maddison has six U21 appearances to his name after first being called up by Aidy Boothroyd in November 2016 - and it could actually be with the age-group side where Maddison strengthens his case for senior squad inclusion this summer. The midfielder impressed with his attitude on his return to the U21s after his stint with Southgate's side earlier this season, and is eligible for June's U21 European Championships in Italy, when England will be aiming to add another youth title to their honours list. A recent 2-1 defeat at home to Germany suggests that will not be straightforward, and Maddison - who qualifies for the tournament cut-off despite now being 22 - seems likely to be a key part of a strong group of players heading to the competition. Maddison would head there knowing Southgate, who has already promoted many of the former U21 players he coached himself at the youth level, will have a close eye on proceedings. Leicester host Newcastle on Friday night, with the clash kicking off at 8pm. You can watch build-up and analysis from 7pm on Sky Sports Premier League. The Nations League finals take place in June, with Portugal vs Switzerland on June 5, England vs Netherlands on June 6, and the third-place play-off and final taking place on June 9. You'll be able to watch all the games on Sky Sports Football. Head here for all you need to know about the tournament.